You are currently browsing the tag archive for the ‘buckwheat pancakes’ tag. Saturday night… 11pm… must remember to put the clocks back 1hr for the end of daylight savings! Tomorrow is my son’s first game of AFL auskick. He is 4.5yrs old so i am not expecting football genius, just a lot of fun and standing around watching the kids stand around while they watch their coaches stand around and wait for someone to tell them to either catch the ball or kick the ball… it’ll be ace! But seriously, i am excited for him because he is excited and he loves it! I mix my flours with warm water and *whey… then leave them to work their magic while i sleep! WAIT… What the hell is *whey? Isn’t that something Little Miss Muffet was eating… with curds? That just sounds gross delicious! Tell me more about this nutional powerhouse! Whey is a by-product of cheese making. I recently got some unhomogenised organic milk for only $1 per litre and decided it just HAD to be made into ricotta cheese. I used this recipe. Whey contains lots of enzymes and probiotics that assist in making phytates easier to digest – essentially, they make grains digestable and good for you! It’s the same process that used to make sour dough bread. Soaking grains gets rid of anti-nutrients and can make them digestable for those even with food intolerances or those of us who may feel a bit bloaty after too many grains. I am not a scientist or nutritionist… but my friend google has many good sources of information in the topic! This is a good article to start with. So anyway, i get up and beat an egg add some pre-soaked batter to the bowl, baking powder and apple cider vinegar. I add these last 2 ingredients to give the pancakes the lift i like, it’s a great trick for cakes and muffins as well. 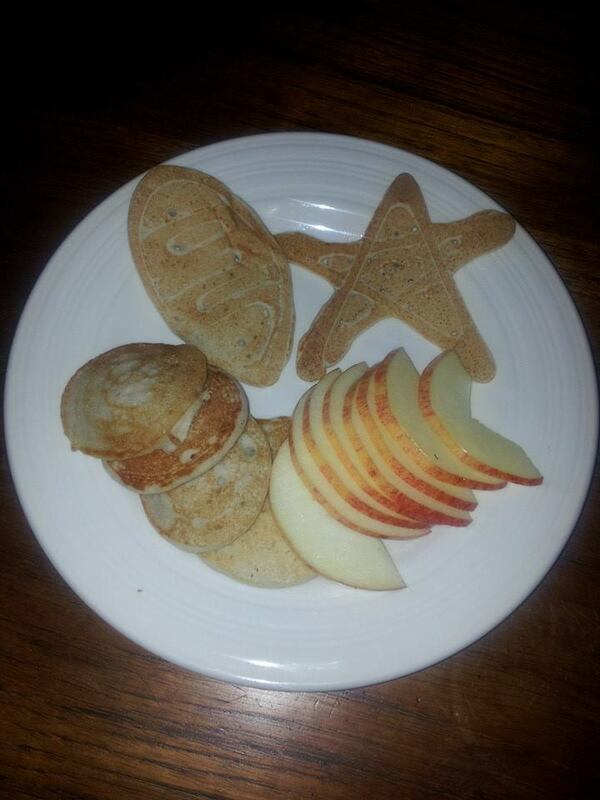 And to make some special shapes i pop my batter in a squeezy sauce bottle and design my own stars and football shaped pancakes/pikelets for my little AFL monster’s breakfast. Served with apple slices, butter and syrup! I then beat 1 egg and added **half the batter, mix well. Cook in spoonfuls (or using a squeezy bottle) in a frypan with coconut oil. These were totally devoured for breakfast and morning tea! With the second portion of the batter i added the egg, baking powder and ACV then also added a grated apple and some cinnamon. These were delicious served warm with butter! I made a second batch of these and left the batter to sit for a full 24hrs. I also added 3 eggs instead of 1 to give them more lift. Leaving the batter for a whole day really gave the waffles a sourdough flavour, delicious! This wonderfully rich and luxurious batter was turned into gorgeous heart shaped waffles – cooked to perfection is an authentic (and possible antique) german waffle maker. They were served hot with lashings of organic butter and maple syrup – for my children and my husband, i did not indulge, but i think i should have!!! 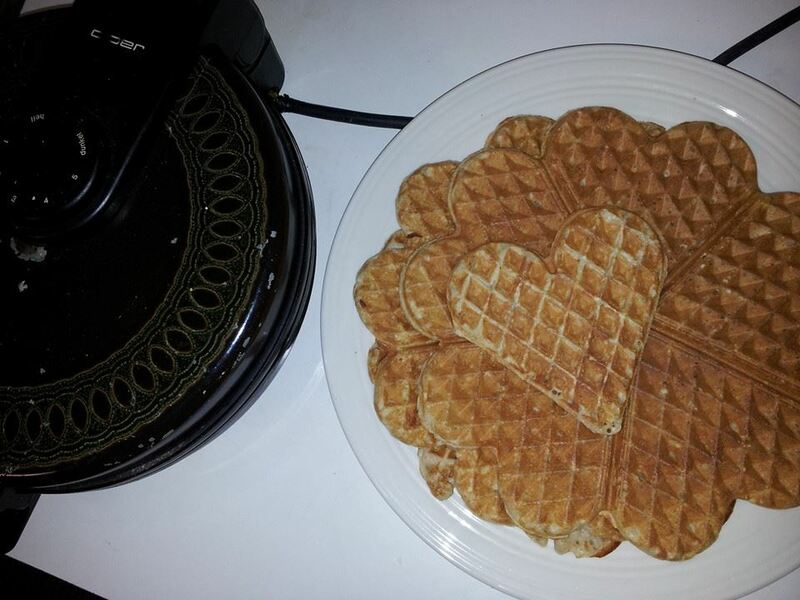 Lovely little hearts and a sneak peek at my waffle iron!